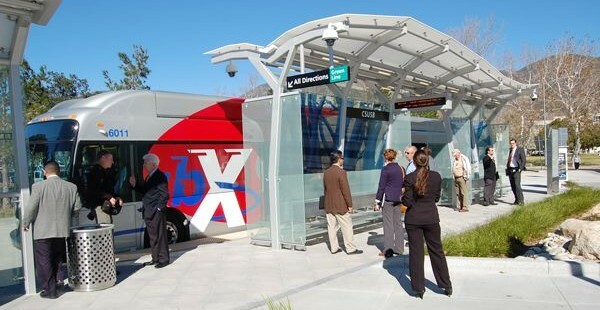 Tomorrow, Friday May 2nd, Southern California Transit Advocates (SoCATA) is touring of Omnitrans’ sbX Bus Rapid Transit (BRT) express service. Omnitrans sbX started operating Monday. Our hope is by highlighting its key attribute, dedicated stations along an exclusive bus lane, that sbX will inspire aspirations in Los Angeles County as Metro studies corridors for a proposed BRT network for possible implementation in the next few years. Just a glance at trade journal Metro Magazine’s survey of Bus Rapid Transit confirms BRT is the object of burgeoning interest, especially in California. We will be taking the Metrolink San Bernardino line train departing Los Angeles Union Station at 9:02 a.m. and scheduled to arrive in San Bernardino at 10:40 a.m. Our guide is to meet us at the San Bernardino station and from there we’ll take local bus service to nearby E Street where we will begin riding sbX. Cost of a Metrolink ticket from L.A. to San Bernardino is $13.25 (one way), $26.50 (round trip) — senior/disabled rate is $6.75 (one way), $13.50 (round trip). I have been monitoring the progress of this project for years and am jazzed at having a chance to finally ride it. And of course anyone who wishes to join us is welcome to do so. The only cost is out of pocket for fares and perhaps a late lunch after the tour is finished. A big thanks to Omnitrans for their cooperation in arranging this tour. What’s the latest status of the Metro study? Thanks for the link. I think that is indeed the latest on the BRT network study. At least the effort continues moving forward. My hope is sbX and the Wilshire bus lanes will create buzz that can be leveraged so that this results in robust BRT instead of glorified express routes a la Metro Rapid and OCTA’s Bravo. FAST has been sharing with stakeholders a mobility hub concept that may be ideal to add to the mix. I hope to arrange a public presentation of it in the next few months.